DNA Painter | What else can you do? 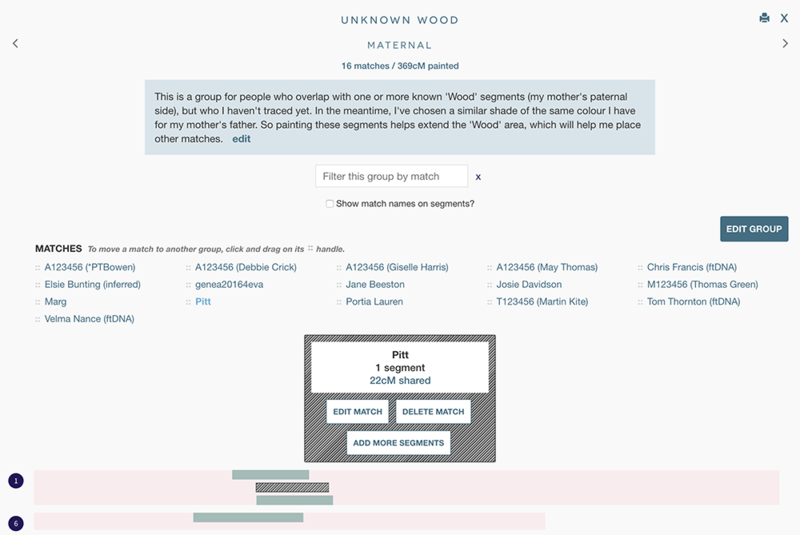 Once you've understood how to paint matches, your aim is to assign the segments for each of your DNA matches to the furthest back ancestor possible. 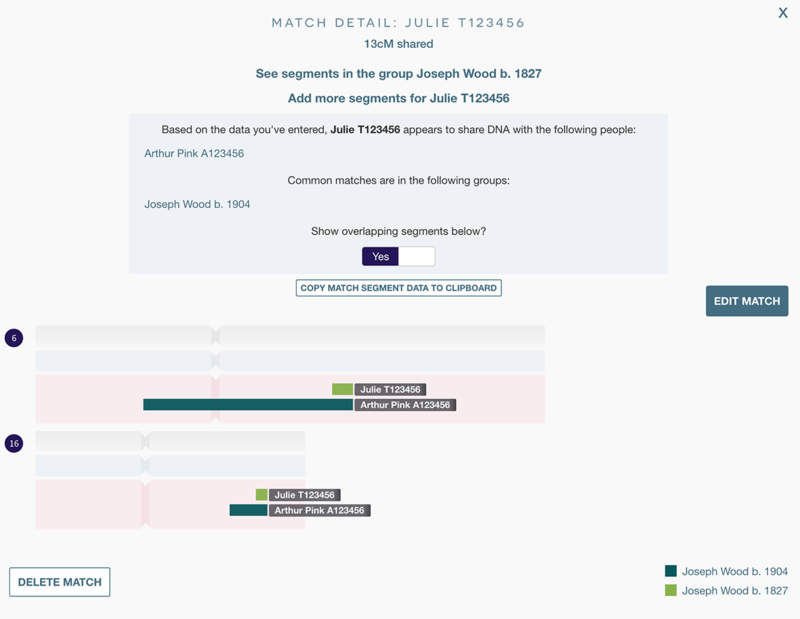 If you have a new match you're unsure of, you can overlay it onto your chromosomes without saving it by clicking 'Overlay these segments'. This will instantly paint these segments (shaded with diagonal stripes) onto your profile and expand the relevant chromosomes, letting you compare these new segments quickly to those you've saved before. You then have the choice to save the new segments or clear them. The site will highlight any overlaps with existing segments, but it's important to remember that you still need to compare your match to the match it overlaps in order to be sure they both match you on the same chromosome! Some matches will be unknown to you, but it may be possible to assign them to a parent or grandparent by comparing them to other matches. For example, if you have a known relative who has also tested, anyone who matches both you and the known relative on an identified segment is likely to come from the same side (maternal or paternal) as your known relative. Depending on your ancestry and circumstances (e.g. if you have a parent, close cousin, uncle or aunt who has tested, or if your parents have very different ethnicities), you may be able to establish easily if the match is on your father's or you mother's side, but not have any more information. Some matches may be absolutely unknown, particularly if you don't have many known relatives who have also tested. If these segments are significant in length (for example, over a 20 centimorgans), or of interest for some other reason, it might still be useful to paint them. You can specify that you don't know which side the match is on, and paint them in their own group. There isn't really a right or wrong way of using the site, and everything can easily be edited or deleted later. DNA Painter is private, so you should feel free to test out ideas and make assumptions. In future, new matches will most likely appear to confirm or deny your assumptions! You can edit or delete any individual segment by hovering over it and clicking the 'Edit Segment' button, and you can edit any group (for example to add notes) by clicking on the group name in the key and clicking the edit button. If you choose a lower confidence level (to indicate an assumption you're not totally sure about), the segments will appear more transparent. Segments are overlaid on top of each other within the each chromosome, but by clicking on a chromosome number, you can view the chromosome detail with the all segments stacked. This can be helpful for identifying any mistakes (e.g. if you've accidentaly assigned segments to the wrong ancestor, you'll see contradictions here) or possible endogomous segments. The match overlay allows you to view all segments for your match at once, and click a switch to show all overlapping matches on this same screen. You can reach the match overlay by clicking on any segment and clicking the 'VIEW MATCH' button. You can click on a group name in the key to view its segments in isolation with a list of matches. This can also be useful for narrowing down how matches interrelate. You can click on a match name to see more information (including the option to edit or delete it) and highlight its matches. There's also an 'Add more segments' button allowing you to add new segments (such as 'X' segments from Gedmatch) to an existing match easily. When you click the 'Edit group' button you will see a form that lets you edit notes and other details about the group, including its colour and whether it's maternal, paternal or unknown. 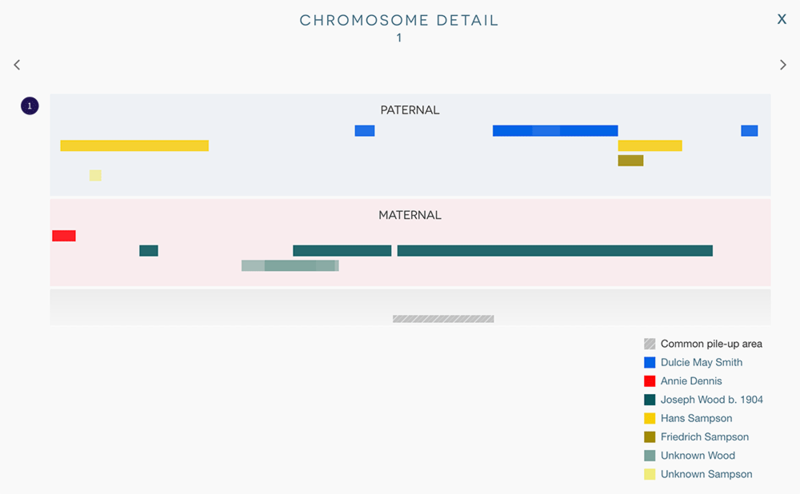 While in the chromosome detail or group detail overlay, you can use the cursor keys or the arrows at the top to navigate between chromosomes or groups. You can also drag and drop a match in order to move it quickly to a different or new group. As soon as you start dragging on a match's handle, a set of groups will appear and you can drag and drop it into the new group of your choice. 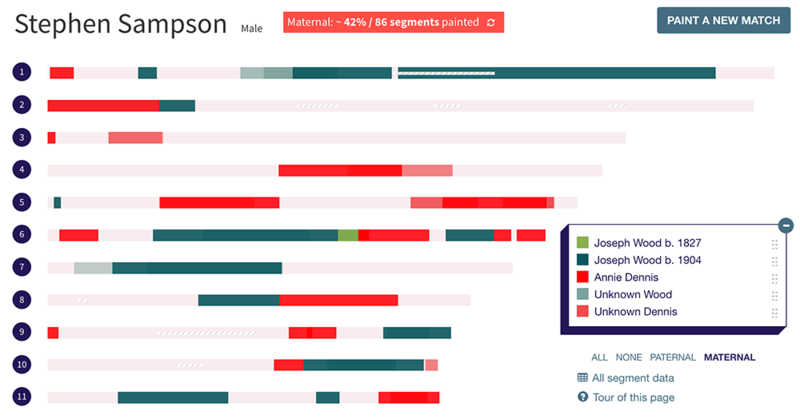 As well as the overall profile view, you can filter segments and just view maternal or paternal. You can also show and hide groups by clicking on the coloured square next to the group name. If the key gets in the way, you can click the '-' symbol at the top right to minimise it, or drag the entire key by the shaded area on the left to move it to a different position. In addition, you can click and drag on the right edge of the key to make it wider. If you find some segments are being obscured by others, you can drag and drop the groups themselves within the key to change their order. For instructions on how to do this, click the 'Edit key' link under the key. When you adjust the group order, the layer order of the segments is also updated - so for example, segments belonging to a group that's at the top will appear on top of those from a lower group. 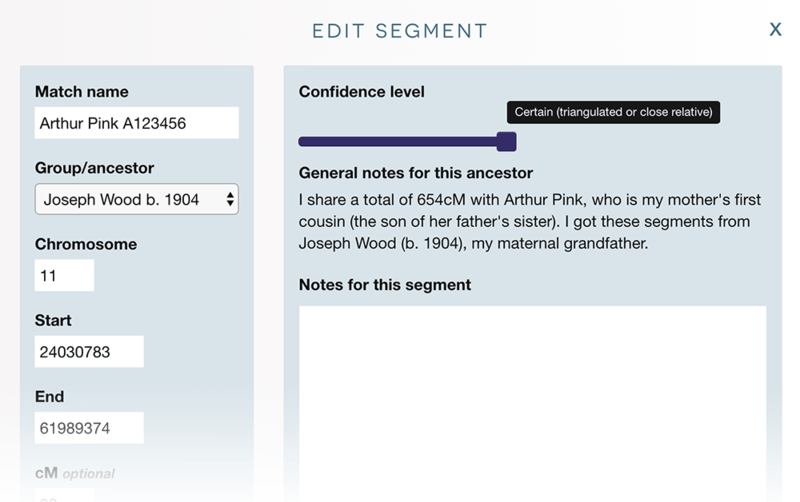 Notes — You can make detailed notes on both segments and ancestors/groups of matches. Confidence level — There's a slider allowing you to indicate how confident you are that a match is useful and that you've identified them correctly. This can be managed on a segment level, or you can set a confidence level for all segments in a group. Segments in which you have less confidence will still appear, but will be more transparent. All segment data — You can view all segment data and notes in a sortable table. This table also has a filter box at the top so you can use it to search for and quickly locate a match. Hover over a match name in the table and a 'View match' link will appear. CSV download — You can download a CSV file of the data in your profile for local editing in Excel or any other spreadsheet programme. Data download — You can download a data file of your profile in a format that can be used to recover it quickly in case of any issues. You can also mark a profile as 'shared.' When you do this, the site will generate a special link. Anyone with this link will now have read-only access to this profile. This way, you can share your research with others, or even use DNA Painter to sketch out a puzzle in a new profile and pass this around for quick feedback. Next: How do you use the import function?